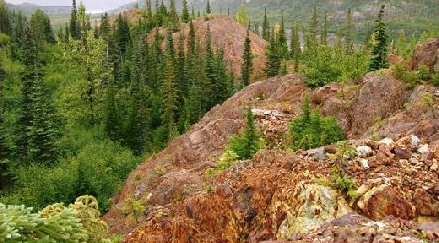 Located in the Golden Triangle of northwestern British Columbia, an area encompassing prolific mineral rich belts that hosts more than 43 past producing mines. 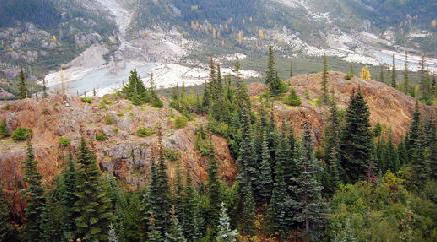 5 of these mines (including one on the Electrum property) are located in the same valley range extending from Stewart BC, north to the Frank Mackie glacier. 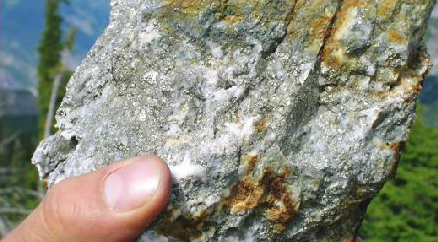 Historic hand mined electrum ore with average grades of 1,661 grams of gold per tonne and 2,596 grams of silver per tonne. Significant drill results as high as 440 grams of gold per tonne and 400 grams of silver per tonne over 0.52 meters, as well as additional elevated silver values of 420 grams of silver per tonne over 0.91 metres and 384 grams of silver per tonne over 0.70 metres. Several other intervals ranged from 100 to 200 grams of silver per tonne. Some broader intervals include 1.06 g/t gold over 50 metres and 3.01 g/t with 2.05 g/t silver over 2.6 metres. Chip sampling includes 54.77 g/t gold and 14,903 g/t silver, 615 g/t gold with 616 g/t silver, 78.7 g/t gold with 114 g/t silver, 131 g/t gold with 2,862 g/t silver, 255.4 g/t gold with 299 g/t silver, 80.96 g/t gold with 80,818 g/t silver, 694 g/t gold with 550 g/t silver, 28.61 g/t gold with 1,272 g/t silver, 20.98 g/t gold with 1,944 g/t silver, and 19.91 g/t gold with 3,923 g/t silver. These results match with similar grades found in drill core such as EL06-18, that intersected 440.78g/t Au over 0.52 meters, or high silver values such as; EL07-09 (583 g/t Ag and 2.44 g/t Au over 0.30 meters); EL07-12 (420g/t Ag and 4.88g/t Au over 0.91 meters); EL07-18 (374g/t Ag and 7.00g/t Au over 0.65 meters) and EL07-09 (384 g/t Ag and 2.49 g/t Au over 0.70 meters) amongst others. In 2015 the Shiny Cliff zone had twenty-two specimens averaging 27,092 g/t silver and 248 g/t gold, the New Blast zone had eleven specimens averaging 11,512 g/t silver and 54.6 g/t gold, a 40 ton boulder off Shiny Cliff had specimens averaging 857 g/t silver and 10.6 g/t gold, and the East Gold mine had thirteen specimens averaging 522.9 g/t silver and 6.55 g/t gold. In 2016 a 5mx15mx2m trench at the New Blast zone had twelve samples averaging 3,461.9 g/t silver and 2.24 g/t gold including an 8 cm wide silver Sulphide core seam that returned 30,200 g/t (1,065.3 oz). Four tonnes of rock not taken from an area mentioned above averaged 539 g/t silver, 2.82 g/t gold, 1.96% lead and 1.97% zinc. Existing roads from property to shipping port in Stewart (40 Km), where essential services are located. Power is available within 18 kilometres of property. 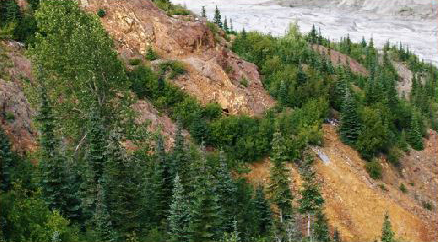 The Electrum Property has the potential for high-grade gold-silver mineralization in epithermal breccia vein systems as well as the potential for bulk tonnage porphyry style molybdenum-gold mineralization.